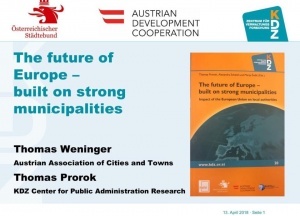 ) The future of Europe is also a task for local governments which have to be involved by the member states and the European Commission.
) “Doing more in a better European Union” is needed and the local governments have to play a larger role in this Europe. This page was last modified on 17 April 2018, at 07:23.